Looking for the ultimate away-from-it-all holiday promising privacy, freedom and no-need-to-lift-a-finger luxury? 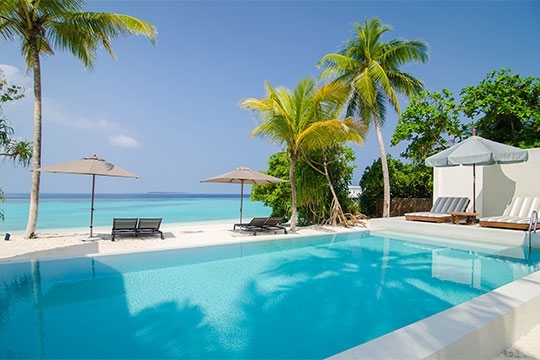 It really doesn’t get better than the Amilla Beach Villa Residences, set on the powder-white sands of a coral-fringed jewel that supermodel Kate Moss rightly calls “paradise, the most idyllic and relaxing place on earth”. 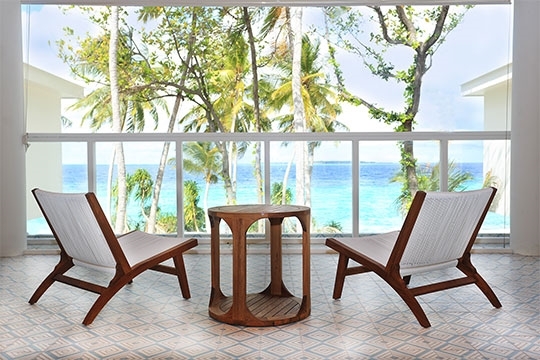 The Amilla Beach Villa Residences are part of the Amilla Fushi resort, on a tiny dot of an island in the UNESCO Biosphere of the Maldives’ Baa Atoll. 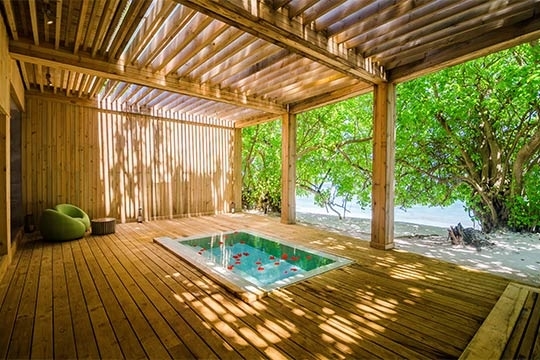 This ultra-luxe tropical utopia works its magic from the moment you book; Amilla Fushi translates to ‘your island home’, and everyone here conspires to create a very personal sense of homecoming. Depending on when you stay, your rate includes either full or half-board, and a Providore (food & beverage) list is provided in advance so you can pre-order all your favourites. 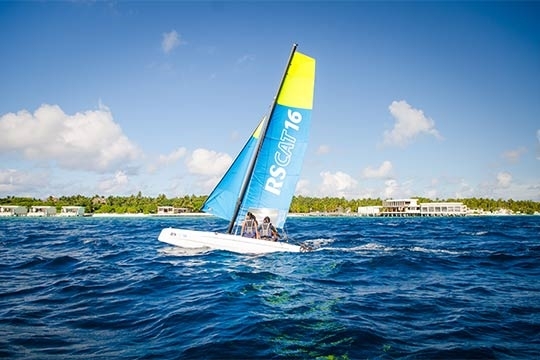 An impressive range of activities can also be organised in advance – from sea excursions and spa therapies, to pro tennis lessons and photo sessions. 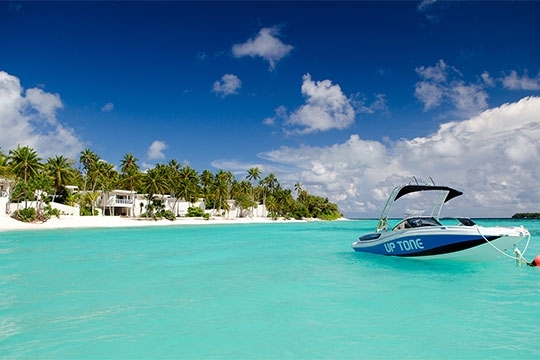 On arrival at Male International Airport, you’re either whisked to a seaplane for an awesome half-hour flight direct to Amilla Fushi, or (allowing for nighttime arrivals) board another plane for a short domestic flight followed by an exhilarating 10-minute speedboat ride to the island. 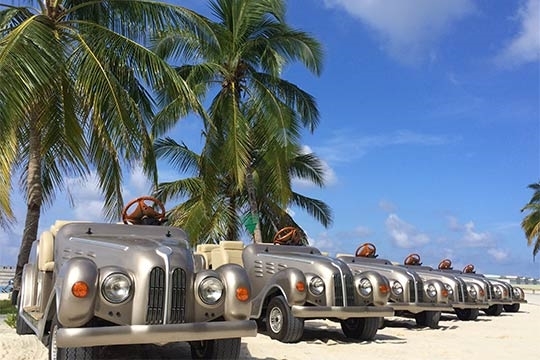 There, you’re joyfully welcomed by your katheeb (house master) who chauffeurs you in your ‘Rolls’ buggy along sandy palm-shaded paths to your villa. Everything is super-spacious within this majestic paeon to contemporary architecture, from the party-ready living rooms and the fabulously equipped kitchen to the decadent master suite. 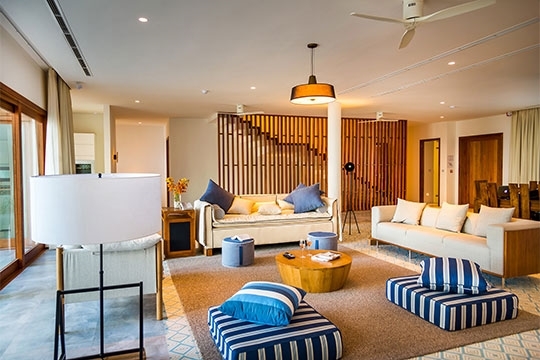 Interiors boast a cool sand-and-aqua colour palette and handsome retro-style teakwood furniture. Outside, your private beachfront pool, plentiful sunbathing spots and a covered terrace for alfresco dining and barbecues are equally appealing. 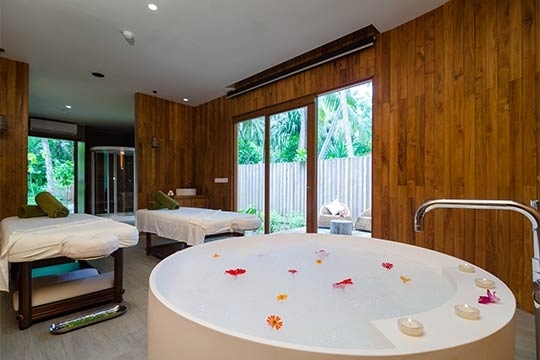 Attention to detail is phenomenal: you’ll find everything from Monopoly to Marantz sound systems, and Aesop toiletries to iPads at your villa. 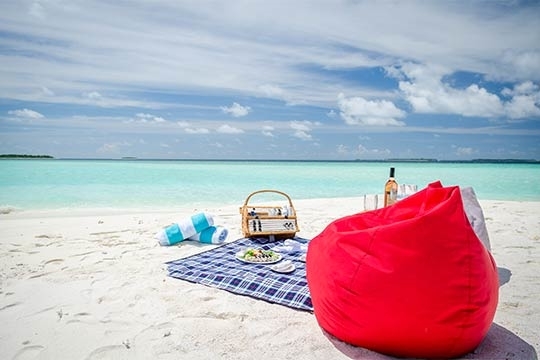 You’d be forgiven for not wanting to leave your private palace – lazing on the beach, swinging in the hammock, or sunning by the pool, but it seems a waste not to take full advantage of the amazing restaurants, astonishing Javuu spa, and seemingly endless land- and marine-based activities on offer. Even if you stay for a fortnight, you’ll barely scratch the surface! A sojourn at Amilla Beach Villas will stay with you long after your return home, permanently imprinted in your memory – and your heart. 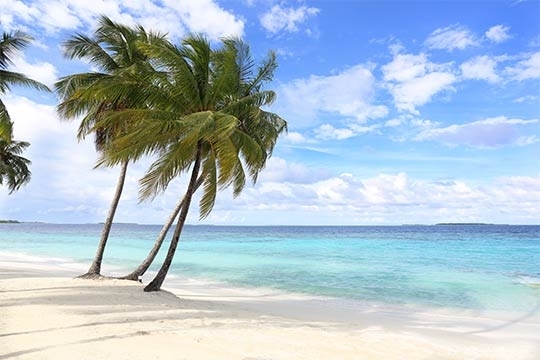 Barefoot coral island luxury for fab family hols. 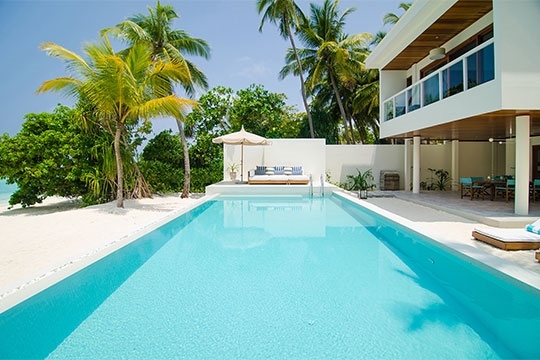 The Amilla Beach Villa Residences front impossibly white powdery sand within a gated community; all you can see from the villa is the turquoise sea unfurling to the reef edge, and the crowns of coconut trees swaying in the sea breeze. Beyond the villa, paths of fine white sand cut through groves of palms shading dense foliage and carpets of ferns, leading to the fabulous restaurants and recreational facilities that support the larger (yet equally exclusive) resort community on this tiny, less-than-one-kilometre-long, jewel of an island. 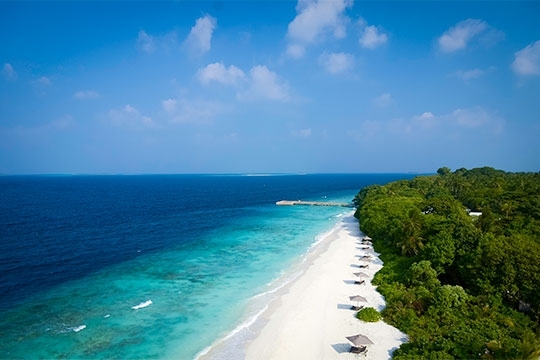 The Maldives is one of the world’s most popular destination islands and an ideal choice for the ultimate holiday in a tropical paradise. 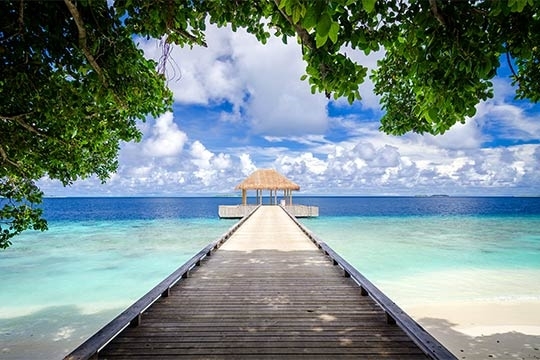 Our villas in the Maldives are luxurious havens, perfectly placed to discover the beauty and natural delights of Baa Atoll, relax on a pristine beach or dive with manta rays and sharks. Our villa specialists will tailor-make your experience in this luxury destination; whether you seek a romantic getaway, serene seclusion or a fun family escape, all is possible. The 4 Bedroom Amilla Villa Residence’s generous accommodation flows across two floors of an ultra-modern beachfront building, entered via a colonnaded walkway. The front door opens into the living and dining room where, on a sea of Moroccan-style tiles, an enormous teakwood dining table and elegant hand-crafted sofas and chairs are set before sliding glass doors overlooking the pool and turquoise Indian Ocean. In the large open-plan kitchen are four bar-chairs set before an enormous marble-topped counter – the perfect spot for cooking-as-theatre experiences. Outside on the large dining terrace is a teakwood table for eight and a professional barbecue. Steps lead to a raised terrace facing the pool and a shaded love seat, and in the white-sand garden double sun loungers, a casual seating area, and a swaying beachside hammock beckon. Also at garden level are a large guest washroom, a courtyard shower and a twin bedroom with ensuite shower. At the top of the grand teak staircase, a study area forms the hub from which the rest of the upper level rooms project. A second living room – large and open-sided – is furnished with modular seating faced to the ocean, and a table tennis table. In each of the two mirror-image guest suites, a hallway leads past a walk-in wardrobe and bathroom to the sleeping area – one furnished with a king-size bed, and one with twin beds. Both have comfy seating and a 42-inch TV. An interesting feature of these bedrooms is the screened balcony with tree-level bathtub. The king room also features an open-to-the-sky shower. Pride of place goes to the huge master suite. Double doors open onto a study area with rows of wardrobes, huge mirrors and a desk. 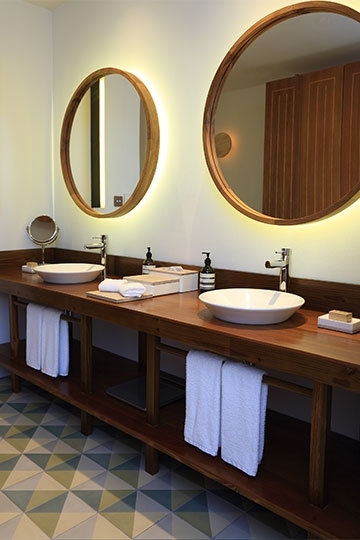 Beyond is the extravagant bathroom: to one side is a huge indoor shower area, and a corridor leading to a sun-drenched courtyard with alfresco shower. A bathtub is oriented for ocean views. In the bedroom, a 2.3-metre-wide bed enjoys stupendous ocean views. Gizmos include a 42-inch TV, Marantz sound system and iPad. On the glass-fronted balcony a daybed is poised for the best sunset views. All bedrooms and indoor living spaces are fan-cooled and air-conditioned. To secure early check-in or late check-out, guests may book the villa for an additional night and a full night’s rate will apply. 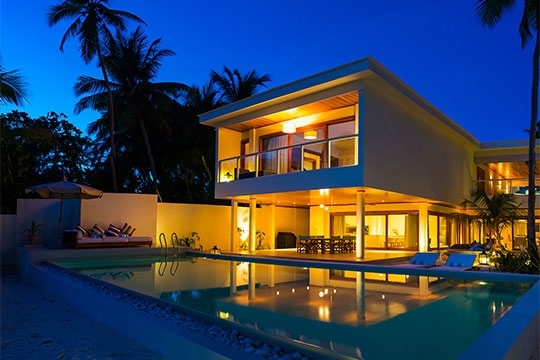 4 bedroom villa located in Maldives, Maldives. Ideal for Beachfront, Body and soul, Bring the relatives, Executive escape, Kid friendly, Gastronomic delights, Fair share for groups, Private island hideaway, Room with a view.